Patty pan squash could more accurately be called "flying saucer" squash because of its appearance—and, in fact, it sometimes is. Some say these little squashes look like Scottish tams. The patty pan is a small, round and flat, with edges that resemble an alien spacecraft. It might be yellow, white or green. 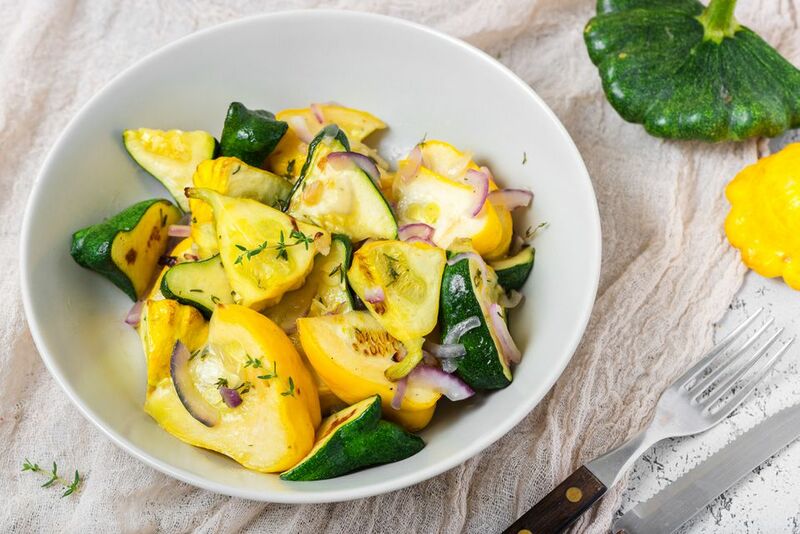 Its appearance aside, patty pan squash is versatile and makes for some delightful summer recipes. It can be grilled, fried, or, in this case, oven-roasted. Patty pans impart a somewhat buttery flavor, although some people think they taste more like olive oil. This easy recipe for roasted patty pan squash uses shallots and herbs and makes a wonderful side dish for dinner parties. Toss the squash, shallot, thyme, olive oil and salt together in a bowl. Spread the mixture out onto a sheet pan. Bake 15 to 25 minutes or until the squash is tender. Monitor it periodically by testing it with a fork. When buying pattypan, look for smaller, young squashes; they tend to be more tender with a more delicate flavor. You can't always find pattypan in the produce sections of mega-supermarkets, so if you strike out at your local grocery, try a farmer's market; they're in season from May through the end of September. Like most summer squashes, the skin is edible, so you don't have to worry about peeling it away first before cutting the squash into chunks. Cut off and discard the tough ends, and you might want to scrape out any visible seeds. Store patty pans wrapped in plastic wrap in the refrigerator for up to three days until you're ready to use them. Pattypan squash is remarkably low in calories, making it diet-friendly. This squash has more vitamin A than zucchini does, and it's a good source of vitamin C as well. For a different flavor, try using rosemary or marjoram instead of the thyme, or use a combination of your favorite spices and herbs. You can also cut the patty pans into horizontal slices for an alternate presentation.